On the bottom of every eBay page is a group of links: Click Community to connect to other eBay members; or click the Announcement link to check proposed changes to the site on the Announcements page. But there’s a whole lot more to the Community area of eBay. Take a little time to explore it for yourself. Answer Center: Questions can be asked on almost any topic. Everyone may have an opinion, and you may get a solid answer. 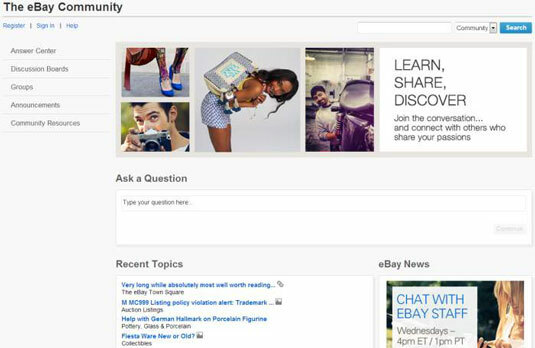 Discussion Boards: Click the links in this section to be whisked to eBay’s discussion boards. Groups: Are you a joiner? There are lots of folks with special interests on eBay that want to share. Here’s where you will find them. Announcements: This area covers general news, policy changes, technology updates, system announcements, and more. You can also find links to eBay events, including Town Hall meetings, eBay Radio, and Online Workshops. Buying Guides: Here you will find community-generated content. Want to read other eBay members’ opinions on products? Read their reviews? Click this area and you can also search for Guides (short product-related posts). From the Reviews pages, you will find links to items selling the product and for what price it is being sold on eBay. Community Resources: Here you will find links to policies, Security Center, and the Feedback Forum. There are many places to connect with other eBay community members. Many are active on social media networks.